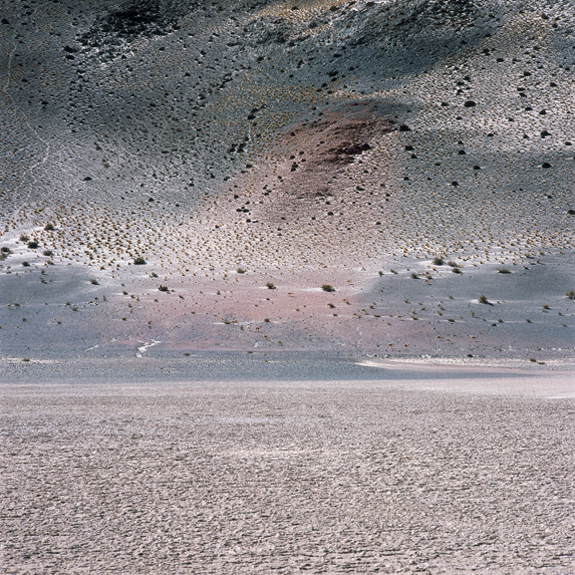 This series, titled NOA, is taken in the Northwestern region of Argentina — commonly referred to as NOA. It is an arid region of salt flats and volcanoes in the high pre-Andean plains towards the Chilean and Bolivian borders. This particular selection of images are shot at an average altitude of 4,000 meters, where the air is scarce, animals are a rare sight, and the indigenous plants are low-growing shrubs, bushes and grass. I was instantly struck by the otherworldly magnificence of the landscape, and wanted to document it and convey this through the photographs. I chose to exclude the horizon in the composition, and leave as few clues as to scale as possible. The result of this is a rather disorienting image, where proportions and perspective are perplexing. This sense of disorientation is similar to how I felt when I was there: the high altitude, lack of air, total silence, and infinite expanse gave rise to feelings of confusion, vulnerability and daunting. I also feel that the square format distances these images from the more traditional landscape format, and therefore allows for further ambiguities.